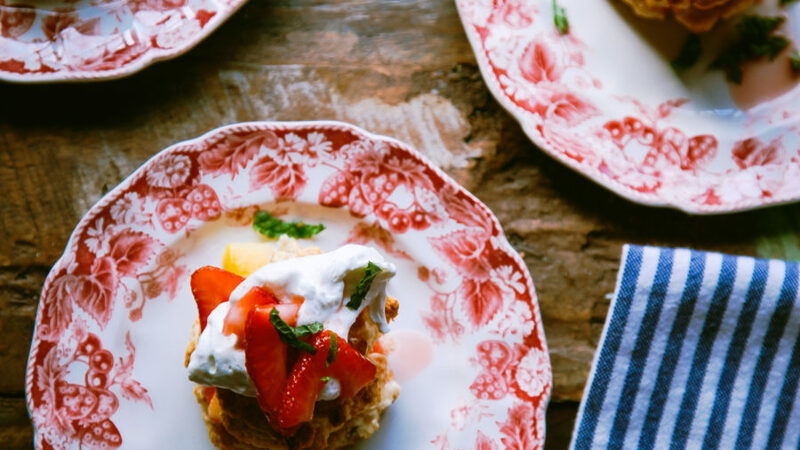 Mangos and strawberries taste and look good together, especially when united in a tender, lime-scented dessert. The recipe is from Isabel Cruz, chef and owner of Isabel Pearl, in Portland, and Coffee Cup Café and Isabel’s Cantina, both in the San Diego area. Preheat oven to 350°. In a large bowl, ­using a mixer with the paddle attachment, mix flour, sugar, baking powder, and lime zest on low speed. Beat in ­butter on medium speed until mixture looks like cornmeal. Drizzle in milk and cream; mix just until incorporated, a few seconds. Line 2 baking sheets with parchment ­paper. Drop dough by generous 2-tbsp. portions onto sheets to make about 12 shortcakes. Bake until golden brown, about 25 minutes. Slide parchment with shortcakes onto racks and let cool until warm or completely cool. While shortcakes are baking, make toppings: Hull strawberries, slice thinly, and put in a large bowl. Mix gently with 1/4 cup sugar. Let sit until very juicy, 20 to 30 minutes. Pour half of berries into another bowl with about half of ­liquid and crush lightly with a fork or wooden spoon. Peel mango and cut fruit off pit. Slice fruit thinly, put in a bowl, and toss gently with 3 tbsp. sugar and, if fruit is bland, the lime juice. Whip cream with remaining 1 tbsp. sugar into soft peaks. To serve, slice tops off shortcakes and spoon crushed strawberries and a bit of the juices over bottom halves, followed by mangoes and some sliced strawberries. Set tops in place. Finish with a dollop of whipped cream, a strawberry slice or two, and a sprinkle of mint if you like. *Not all baking powders are created equal. Widely available Clabber Girl leavens mainly in response to heat. Rumsford baking ­powder responds most strongly to liquid, and has less sodium. If you use it, add 1/2 tsp. kosher salt to the recipe and bake the dough right after mixing with the milk and cream, before the rising action slows. Make ahead: Shortcakes, cooled completely and stored airtight, up to 4 days ­(recrisp if needed in a 350° oven for 5 to 7 minutes).